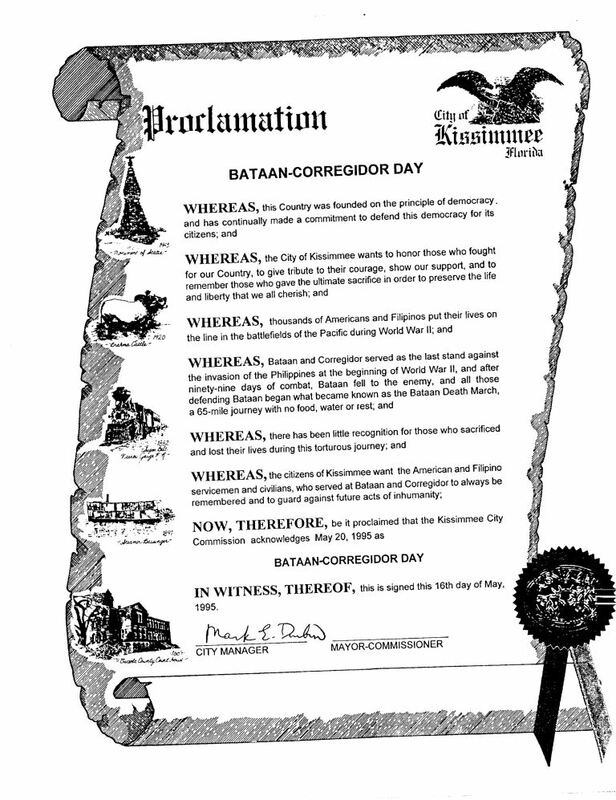 Proclamation declaring May 20, 1995, Bataan-Corregidor Day in Kissimmee, Florida. The city holiday was established to honor the thousands of Americans and Filipinos who fought for the Allied Powers at the Battle of Bataan and the Battle of Corregidor during World War II. The proclamation was signed by Mark E. Durbin, the city manager of Kissimmee, on May 16, 1995. The proclamation was created to correspond with the official dedication of the Bataan-Corregidor Memorial, located on the corner of East Monument Avenue and Lakeshore Boulevard at Lakefront Park. The Battle of Bataan lasted from January 7 to April 9, 1942, and marked the most vital phase of the Empire of Japan's invasion of the Philippines during World War II. The United States defended the Commonwealth of the Philippines, but ultimately the battle resulted in the largest surrender in both American and Filipino military history. The forced transfer of 60,000-80,000 Filipino and American prisoners of war (POWs), known as the Bataan Death March, began on April 9. The POWs were subjected to physical abuse and murder. An estimated 2,500 to 10,000 POWs died before reaching Camp O'Donnell. After Bataan fell, organized opposition against Imperial Japan in the Philippines became decimated. The Battle of Corregidor was waged on May 5 and 6 &nbsp;and resulted in another American-Filipino defeat. This event marked the fall of both the Philippines and Asia to Imperial Japan. American and Filipino forces were able to recapture the island in 1945 and the Bataan Death March was declared a war crime following the end of World War II. Original city proclamation, May 16, 1995: City of Kissimmee Archives, Kissimmee, Florida. Digital reproduction of original city proclamation, May 16, 1995. City of Kissimmee Archives, Kissimmee, Florida. Originally created by the City of Kissimmee. Copyright to this resource is held by the City of Kissimmee and is provided here by RICHES of Central Florida for educational purposes only. City of Kissimmee. 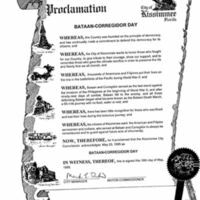 “Proclamation of Bataan-Corregidor Day.” RICHES of Central Florida accessed April 22, 2019, https://richesmi.cah.ucf.edu/omeka/items/show/2836.